Before you even begin reading this post, I demand that you whip out your phone or iPad or tablet or Kindle or whatever and buy A History of Loneliness. Here’s a link to order it off Amazon. Do it. Okay. So I know I’ve been promising to do a blog about John Boyne for weeks, but I’ve been putting it off because I have no idea what to say other than that he’s one of the greatest novelists of this century and deserves way more recognition for his work. I came to this conclusion after reading A History of Loneliness, and then gushing about it in my review, but my faith in him was reestablished after I listened to him being interviewed at my school’s annual book fair towards the end of May. I’m not sure that many people will totally understand what it felt like to sit in the audience of Boyne’s talk as a totally smitten teenage fan, because I’m fairly certain that there were only a handful of listeners under the age of thirty in the venue. Not that that’s a bad thing at all, just that as teenagers we have a whole lot more hormones and are still plagued by the perception that the world’s a whole lot bigger and crazier than it truly is. And teen readers are the worst, because we take all that pent up emotion and wonder and transform it into a psychotic obsession with other people’s creations. To be in the presence of a creator of one of the worlds in which we've submerged ourselves completely for a couple of weeks (or even days) is mind-blowing, because in a sense we’ve seen inside that author’s head, and there’s some sort of bizarre connection between author and reader that isn’t really there, but it feels like it is. It’s a totally different experience to meeting a Kardashian, or whatever. You don’t scream, or faint, or yell your Twitter handle at them. Instead, you kind of admire them from a distance and wonder how the hell somebody so normal managed to change your entire worldview in four-hundred-or-so pages. That’s exactly what it was like to meet John Boyne. If by meet, I mean quietly stare at from a few meters away whilst hitting my friend repeatedly on the arm and whispering, “Oh my god it’s John Boyne,” over and over again until we made our way into the venue and sat in total admiration of him once again. And we were totally content with doing just that. It was like watching a rock star at a concert, except a lot more nerdy and with less bras being thrown onstage. 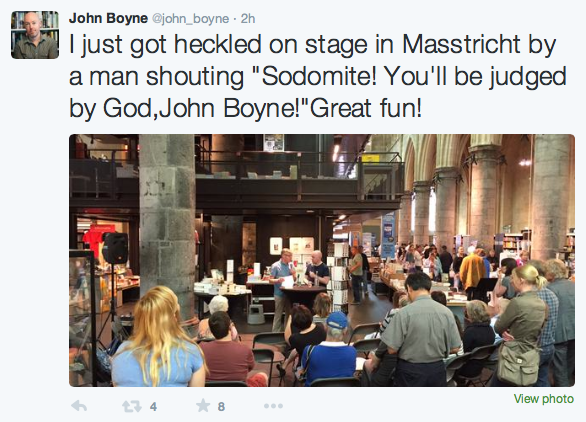 John Boyne is incredible. I’ve read two of his novels, and am currently fifty pages from the end of a third (shamelessly procrastinating on finishing The Absolutist because I’ve already cried twice and can already feel a rage-and-tear-filled rampage coming on with every page I read), and I have to say that I’m totally in love with everything he’s written so far. It isn’t hard to guess that Boyne’s been through some awful, messy experiences in his lifetime (he even admitted to it in the interview), yet he doesn’t ask for sympathy, or pity, or a documentary in his honor. He’s faced with people’s stupid opinions on the way he lives his life pretty much every day, but he’s so positive and compassionate, taking everything in his stride and generally just being pretty awesome. I think I mentioned it before in my review of A History of Loneliness, but even though Boyne writes about such complex, controversial issues, he does it in such a way that he’s not directly critical of any of his characters, or even the people in the real world who have the same narrow worldview concerning the issues he confronts. None of his novels are didactic – he’s simply telling a story and letting his readers make what they will of it, and that’s quite amazing.